That's because there's two channels in the .raw. 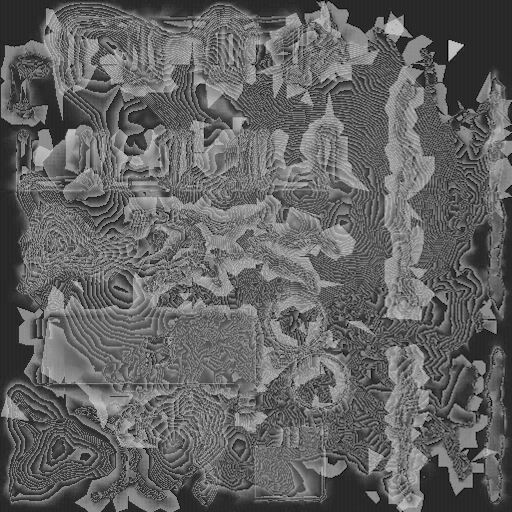 One of them is that, and the other is the actual heightmap. Just delete the channel that shows that ^^^^^. Thanks Chrispy... so the included instructions make sense now. But PSPX2 doesn't seem to offer the choice of 2 channels. Only 1 greyscale, 3 RGB, 3 CMY or 4CMYK. I`ve no idea of the options available in psp m8...Chrispy is bang on though,the raw stripper,strips the image to a dual channeled raw..The upper or channel 1 is the one that will require deleting. See if you can get phOtoshop m8...Or send me the raw and i`ll sort it for ya. Got it. Thanks. PSP - you have to pick the number of channels - and 2 is not an option. Ph0t0sh0p detects it automatically. Just out of curiosity though... what is that first layer about ? Placement of vegetation ? No idea what that first layer is about.Not really looked into it.